Most people shy away from Rosé wines thinking they are going to be sweet like a pink zinfandel. Think again! 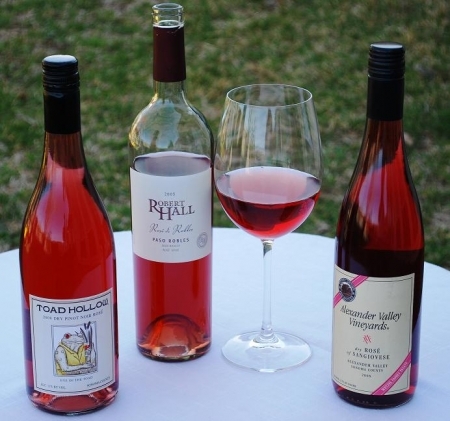 There are variations of Rosé wines that have only a hint of sweetness to some that are very dry. I have come across a few that are sweet, but most are not. Rosé wines are a great alternative to the various white and red wines and most often white and red wine drinkers can agree that this type of wine is great! I am not a wine tasting expert, but in my opinion they have the light crispness of a white with the complex body of a red, without the tannins. They are a very different type of wine and come in various flavors as do Chardonnay’s and other styles of wines. The three featured are quite dry with only a hint of sweetness. For an alternate selection of Rosé wines see Dry French Rosé Wines. These types of wines should be served at about 48 degrees Fahrenheit and not icy cold. No need to test it with a thermometer, if you take it out of the fridge and let it sit at room temperature for about 20 minutes it should be right. If served too cold, it won’t have much flavor. Allow it to come to proper temperature and you will taste the difference, not to mention the true flavor of the wine. Chill and let come to temperature to about 48 degrees Fahrenheit (basically take out of the fridge and let sit at room temperature for about 20 minutes), open, pour and enjoy responsibly! Remember to drink these wines at proper temperature (not ice cold) to experience the true flavor of the wine.